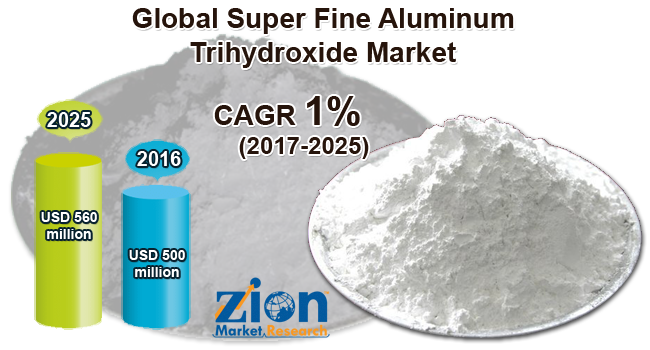 The new report by Zion Market Research on the “Super Fine Aluminum Trihydroxide Market — Global Industry Analysis, Size, Share, Growth, Trends, and Forecast 2017 – 2025" has a vast information about the market and its potential. The global super fine aluminum trihydroxide market was valued at around USD 500 million in the year 2016 and it is expected to reach approximately USD 560 million by 2025. The global super fine aluminum trihydroxide market is expected to exhibit a CAGR of approximately 1% between 2017 and 2025. Increasing demand for the flame retardant plastics and the availability of the aluminum trihydroxide at an affordable price are the major factors driving the super fine aluminum trihydroxide market. Since super fine aluminum trihydroxide is an excellent smoke suppressant it is widely being used as a flame retardant. The rapid pace of industrialization and need for stringent security measures across various end-user industries is expected to propel the growth of super fine aluminum trihydroxide market in the coming years. Our research analysts came up with the conclusion that, among all the end-user industries chemical industry anticipates registering the highest CAGR growth in the coming years. As aluminum trihydroxide is widely used in the formation of various new aluminum compounds its demand is expected to increase in the coming years. The global super fine aluminum trihydroxide market is segmented on the basis of the method of preparation, end-users, and the geographical regions. Chemical and mechanical are the two methods used for the preparation of super fine aluminum trihydroxide. In the chemical method, chemical agents or catalysts are used for the production of fine powder metal. Whereas, in the mechanical method mechanical forces such as compressive and shear forces, impact to facilitate the particle size reduction of bulk materials. The mechanical method accounted for a major share in the global super fine aluminum trihydroxide market. It is expected that this segment will register the highest CAGR growth of 1.2% over the forecast period. The demand for the mechanical method is more as it is cost effective than the chemical method. Some of the major end-user industries of super fine aluminum trihydroxide include electronic, chemical, plastic, rubber, glass, and paper among others. By end-user, the chemical industry is expected to register the highest CAGR growth rate of 1.4% during the forecast period. The wide application of the aluminum trihydroxide in the wastewater treatment and drinking water purification is expected to significantly increase the demand for the super fine aluminum trihydroxide. In 2016, the electronic industry held the majority of the share of the global super fine aluminum trihydroxide market. The application of super fine aluminum trihydroxide in electronic industry is increasing owing to the high use of aluminum for the manufacturing of the electronic products such as electronic sealing material, low smoke halogen cable material, electronic wires, and other products. The Asia Pacific contributed the highest market share of around 43% in the global super fine aluminum trihydroxide market in 2016. In the Asia Pacific, China anticipates dominating the super fine aluminum market in terms of revenue. China is the largest producer and consumer of super fine aluminum trihydroxide. As various international ventures are making investments in the chemical companies based in China the super fine aluminum trihydroxide market is growing positively in the country. The major market players in the super fine aluminum trihydroxide market are Albemarle Corporation, Oyak, Huber Engineered Materials, Aluminum Corporation of China Limited, KC Corporation, and Showa Denko K.K., among others.